This evening was the Drama Class night, when I take my two plus one more to a drama lesson at a big leisure centre. We always enjoy the evening despite the slightly rushy nature of eating early straight after school and then getting to the class on time, when nobody can find their shoes, or their book for the car or remember to go to the toilet until we are about to drive away… the usual stuff. They are a happy bunch of three and I enjoy their nutty company. I also enjoy the slightly-less-than-one-hour of free time at the centre when I can draw just for fun. This week’s 52 Week Illustration Challenge theme is ‘feast’. It’s not a theme that lends itself to time poor folk because it conjures up mental images of banqueting tables, rife with imaginative and mouth watering detail. Forget that. Having grabbed the nearest half-stocked ‘art backpack’ as I went out the door with the mad ones, I found that I had limited supplies with me. (You were wondering what that subtitle The Fast was all about, weren’t you?) I had a vintage book to draw in and a box with pencils, fine point felt tips losing their inkiness, a brush tip black pen (also fading), one deep terracotta red crayon and a small paintbrush but no water receptacle. Thinking I’d hopefully find a pithy quote to illustrate in the vintage book – something that brimmed with feastiness, or failing that, feistiness – I found it was all about a family during the Gold Rush and that Hugo had used the first half to practice scribbling with thick black texta. Not to be deterred, I found a page with a description of an extravagant breakfast. I set to work illustrating it using a pencil and the first subject that came to mind: a chicken serving breakfast. Unfortunately the chicken was so long and elegant of neck that she obscured the text she was illustrating, so I swiftly moved on. 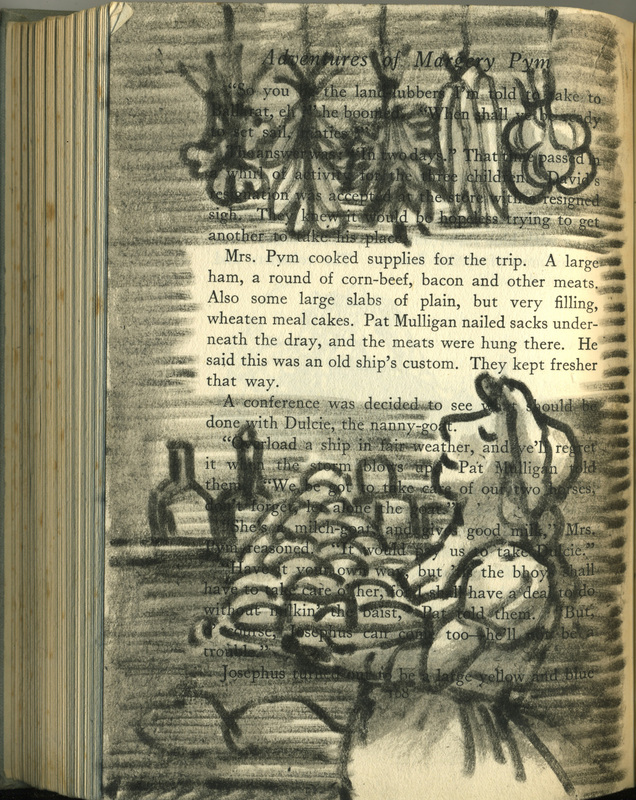 I found the page above and quickly drew Mrs Pym in her kitchen with the fading brush tip. She’s okay. But remembering that the brush tip is water soluble I found I hankered to deepen the tone with a bit of water. No water. Aha! Yes! You guessed it. The Curse of the Black Tongue! I confess I glanced around me to see that nobody was deeply offended, as I proceeded to use the nearest clear liquid to hand… or mouth. I had half a drama class still to use… what could I find? After a few minutes of fruitless searching, I gave up on wasting time looking for food references in the vintage book. 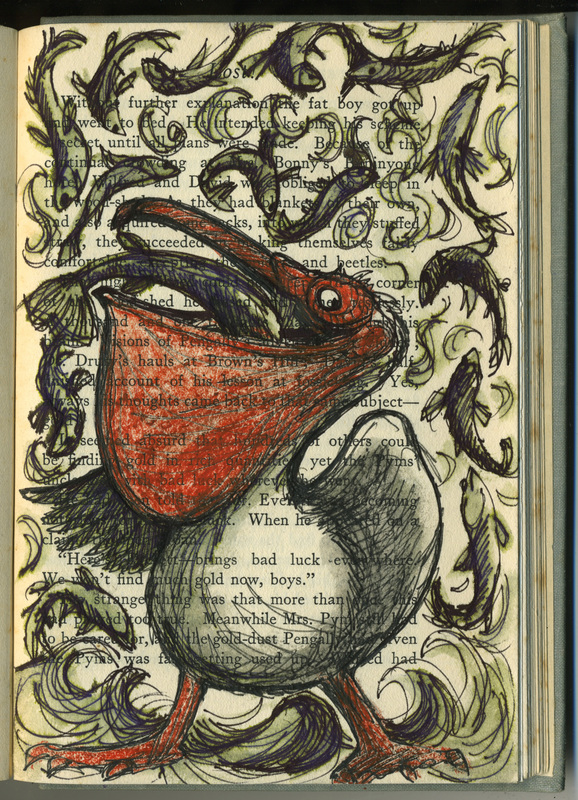 I thought I’d draw a pelican with a border of fish leaping around him on the page. And so I did. But the fine point markers kept running out on me as I drew, so I kept changing, keeping to a .5 or below. Although a real pelican would be more likely to feature blue legs I think, the red crayon came in handy here. And once complete, I was just left thinking how much I’d like one more colour to highlight the fish with. If only! Oh happy pelican! As I resorted to the Black Tongue again in a not-very-hopeful kind of way, thinking that this time, the ink was waterproof, I found to my delight that all but the bird’s body and one wing were drawn in fine point markers that were water soluble and which when wet became green! I am quite pleased with my pelican page. But I can still taste that ink on my tongue. This entry was posted in 52 Week Illustration Challenge, altered books, art projects, books and reading, Uncategorized and tagged #illo52weeks, 52 week illustration challenge, art exercise, art materials, feast, improvisation on June 4, 2014 by Judy Watson. You do what you have to do sometimes. Great results! Ha ha ha! Yes it was fun really.